The 2011 Summer Social Webshop (@Webshop2011) was the result of a collaboration between the University of Maryland’s Human Computer Interaction Laboratory (HCIL), its College of Information Studies, Sociology and Computer Science departments, and Institute for Advanced Computer Studies, as well as the Social Media Research Foundation. The Summer Social Webshop brought together 40 doctoral students (chosen from 160 applicants) to hear and engage with more than two dozen leading researchers exploring digital social landscapes from a variety of perspectives. The students’ backgrounds spanned computer science, iSchools, sociology, communications, political science, anthropology, psychology, journalism, etc. — and their interests included social networking tools, blogs and microblogs, user-generated content sites, discussion groups, problem reporting, recommendation systems, mobile and location aware media creation, and other social media. Encourage increased educational opportunities in universities and industry. These goals were addressed by the leading research speakers such as Amy Bruckman (Georgia Tech), Noshir Contractor and Eszter Hargittai (Northwestern), Nicole Ellison and Cliff Lampe (Michigan State), Tom Malone (MIT), and Loren Terveen (U of Minnesota), plus local speakers from the University of Maryland, as well as Galluadet, Howard, and Towson Universities. A special morning session on health/wellness opportunities for social media was organized by Brad Hesse of the National Cancer Institute (NCI) and included Sylvia Chou (NCI) and Robert Kraut (CMU). Policy issues were also addressed. For example, Erwin Gianchandani delivered a presentation on the Computing Community Consortium (CCC) on Wednesday, and participants traveled to downtown Washington, DC, for a Thursday afternoon policy-focused session at the New America Foundation, organized by Tom Glaisyer. This event was modeled on a program called “Webshop” (Web Workshop) that was organized by John Robinson and held for three consecutive summers in the early 2000s. Many people who attended or spoke at the Webshop events remember it enthusiastically. The students who attended include some of the now leading researchers in the field of social science studies of the internet; indeed, there is an impressive alumni list. As the last Webshop was held in 2003, there have been significant changes in this space since then. Twitter, Facebook, YouTube, foursquare, Wikipedia, Apple’s iPhone and iPad, Android, Mechanical Turk, etc., were all new or non-existent when the first Webshops were run. Today we have more reason than ever to focus on the details and patterns of computer-mediated human association. As ever more people channel more of their communications through digital media, the social implications are growing in power and visibility. Social media is becoming a valuable data resource for the social sciences and policy makers that is growing in scale and promise. The billions of traces of interactions enable analysts to build a picture of an aggregate whole, and to start to grasp the terrain and landscape of societies and their participation in social media. While social participation can bring enormous benefits, it often fails, or worse, can be manipulated by malicious users, destructive organizations, and oppressive governments. Indeed, the idea of Technology-Mediated Social Participation has been maturing for more than two years. An earlier NSF grant led to two workshops to develop a research agenda around social media applications that were aligned with national priorities (see details here). The workshop teams produced 7 papers, published in the November 2010 issue of IEEE Computer. 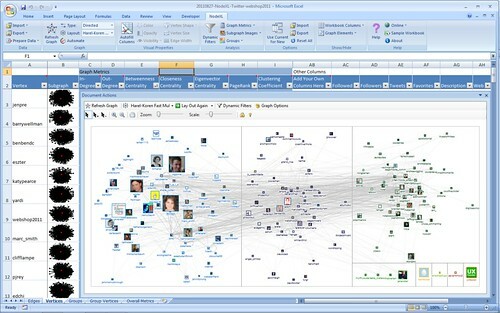 Another objective of the Summer Social Webshop was to teach participants about tools like the free and open NodeXL social network analysis package to gather and analyze social media data. For example, below is a map of the connections among the 168 people who tweeted the term Webshop2011 through the duration of the event. These maps reveal the dense web of connections among the people who contributed to the discussion about the event along with the ways that they group together. The key people within each group can be identified to highlight the leading voices as well as the people who link and connect groups to one another. Revealing the landscape of social connections through social network analysis was just one of the methods reviewed during the event which touched on survey methods, experiments, ethnography, log file analysis and interviews. Special thanks to the National Science Foundation for its generous support and to Google Research and Intel Corp. for additional assistance. This summary was originally a contribution to the Computing Community Consortium Blog by Summer Social Webshop organizers Alan Neustadtl, Jennifer Preece, and Ben Shneiderman, faculty at the University of Maryland at College Park, as well as Marc Smith of the Connected Action Consulting Group. Doctoral students in computer science, iSchool, sociology, communications, political science, anthropology, psychology, journalism, and related disciplines are invited to apply to attend this summer’s 4-day intensive workshop on Technology-Mediated Social Participation (TMSP). During the 4-day workshop, students will attend presentations from an interdisciplinary group of leaders in the field and engage in other research and community-building activities like working on short-term projects, sharing research plans, developing new research collaborations, learning relevant software, analysis methods and data collection tools, and meeting Federal policy makers. Accepted students will receive financial support. We will provide suggested places to stay, but students may arrange to stay with friends or relatives in the area. Summer Social Webshop Webmaster: PJ Rey .